Following last weekend's positive reports, Van Trump seemed a nice option for finding corn snow with clearing weather and freezing levels predicted to reach 11000 ft. It also seemed like a fine testing ground for my new Garmont Mega-Rides, Volkl Mountain NJs, and Dynafits (my first new AT boots/skis since 1996, and my first time trying Dynafits). So David Coleman and I headed up, exactly 52 weeks after our previous trip there. Last year, we had skied continuously from the Comet Falls trailhead at 3600 ft, but this time we knew that a lot of hiking was in store. At least this year I didn't forget my camera. The first snow and ice patches were found starting around 4400 ft, which made some of the steep sidehill portions of the trail interesting. The early morning sun angle was perfect for forming rainbows in the mist of Comet Falls, so we stopped several times to take photos and made a quick side trip to the base of the falls. More continuous snow was reached by 5400 ft above the falls, but nothing worth skinning up until the trail flattened at 5800 ft. We skinned up the standard Van Trump route, occasionally passing or being passed by another ski party of 3 which was taking a less direct route. Trail breaking required a bit of effort in 3-6" of softening mush, so eventually above 8000 ft we followed their skin track up onto the Turtle snowfield to reach a reasonably flat spot near 9850 ft. By now it was almost 4pm, the other party had skied down past us a bit earlier, and the snow was firm and crusty, so it was time to turn around. Superb views of the Kautz Glacier ice cliffs far above, and the Wilson Glacier below and to the right, looking all the way across to some skiers on the Muir Snowfield. The highest 200 feet were nasty crust with protruding ice blocks, not the best spot for my first turns with new boots and skis. But soon the snow softened and we enjoyed some fine corn snow, it was best on the SW aspects which had only a couple inches of soft snow on a firm base, but more variable and difficult to ski on southerly or SE aspects which had deeper snow above the solid layer. The corn continued down to about 8000 ft, and below that everything was heavy mush, lots of wet and unconsolidated spring glop. David had more fun skiing this on his fatter Atomic RE:X's, while my narrower and lighter Volkls tended to sink just a bit and be deflected by the mush. We skied back down to 5800 ft, enjoying a fine sunset on the mountain above, and then hiked out the trail by headlamp. After driving back down to Longmire around 8pm, it turned out that we'd been locked in above the gate, so I had to walk over to the inn to get the lock combo in order to open the gate (a minor hassle). 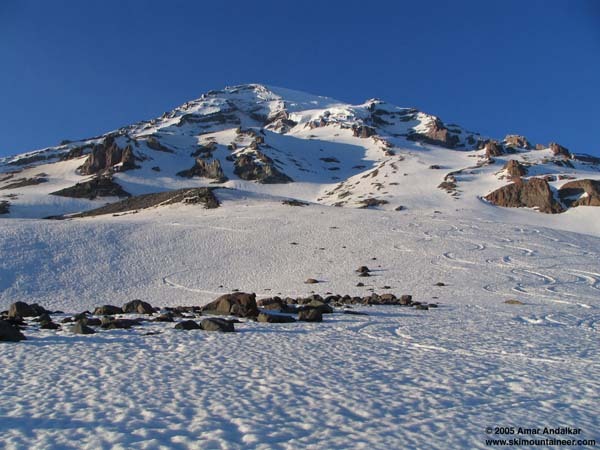 Overall, it was an excellent trip considering that this is now the worst March snowpack on Rainier in at least 90 years. Sinuous arcs grace the Van Trump Glaciers under an early evening glow. Click here for an enlarged version of this photo. Yes, I must say my new Atomic's rock! This was some of the best skiing I've encountered in a long time, despite the variable snow conditions we had. Glad to see everybody on the trip got new boards. So Amar, are your new volk's the ones with the built in skin tip attach point and matching skins? If so how do you like them? Ron, my new Volkls do have the "Skin Clip" attachment point, but I don't have the matching skins. The folks at Marmot Mountain Works said they don't carry the skins, because they've heard bad things about them. I have no further specifics, and I don't really know where to look at or buy those skins. Anyway, my old tattered 64mm Ascension Clip-Fix skins worked fine on this trip, but I just bought a new set of the 80mm GlideLite STS on sale after reading the very positive A+ review of them in the latest Couloir magazine. I'm planning to use those skins for both the new Volkls and my trusty old battle-scarred Tua Mitos. would the route up on the glacier be good into early summer? What about crevasses, are they a problem come summer? Anyway sounds like a great place that i will have to check out sometime and thanks for the report. Where's the photo of Dave ripping it up on his snowlerblades? Or was he going too fast to be photographed? 5) it's nice having a perfect wall-to-wall fit. 6) they are more difficult to remove than normal skins. 7) no more problems with kicking the tip off (of course, I don't think that's a problem with rear-attachment skins, which most people use these days). Phil, thanks for the detailed info on the skins. I think I'll stick with conventional skins that I can use on several pairs of skis. As for photos of Dave skiing, I got some decent shots, but somehow none of them ended up with optimal background or lighting. On a normal snow year would the route up on the glacier be good into early summer? What about crevasses, are they a problem come summer? The route all the way up to Camp Hazard at 11600 ft usually offers good skiing into July, until suncups become too large. But maybe only through May this year unless there is lots of spring snowfall. The Van Trump Glaciers are basically inactive glacial remnants, crevasses are not a major concern and as far as I know, most ski parties don't bring ropes. The "Turtle" snowfield is actually also an inactive glacial remnant, I've climbed it in August when old blue ice is exposed, riddled with narrow (1-6" wide) crevasses which pose little risk. The biggest hazard on the Turtle in summer is a high risk of ice avalanches from the 300-ft high Kautz Glacier ice cliff towering overhead, which can send huge ice blocks tumbling through Camp Hazard and down the Turtle. The park service strongly discourages camping at Camp Hazard or anywhere on the upper part of the Turtle, there are lots of safer campsites along the rocky ridge to its west and on the upper Wapowety Cleaver. If you paid $190 for the skins, you paid more for the skins then I paid for the Volkl Norbert Joos skis which I got for $150 at Gart sports (they still have a pair for this price as of last night). I still haven't mounted mine yet as I'm still trying to decide what to do with them. Do you like your pair, Phil? Are they just another noodley light ski (I already have TM11s and Miras)? Sorry for the thread drift. PS: That's impressive you went 9 years before changing skis, Amar! Most people I know can't go 9 months before buying some form of skis, boots or bindings. Well, I made up for the lengthy hiatus with a sale-inspired buying spree, getting 2 pairs of AT boots in one day a couple weeks ago (Mega-Rides and Adrenalins, the latter to be used primarily as an alpine boot), along with 2 sets of skis over the next week (Volkl AT and alpine setups). And technically, I did get new AT skis in 2000, when I warranty replaced my whole original rig. The Titanal rail on my Fritschi Diamir 1 broke (free replacement with Diamir 2), and REI suggested that I try getting the Tua Excalibur skis warranteed too (topskins were delaminating; Tua offered me the new Mito for less than half price). So I did go nearly 9 years without *buying* AT skis, and my Scarpa Denalis were the only AT boot I had ever used in all that time until this trip. If you have one rugged, reliable, and versatile setup, there's no need to go shopping all the time. I just hope my new gear is rugged enough to last that long, although I have doubts about the Mega-Ride sole's durability since the red Dynafit climbing post has already worn a 1mm deep circular hole in the heel after only 4000 vft of skinning. Anyway, I plan to keep using the old gear occasionally for sentimental reasons, and as my primary AT rock skis. Do you like your pair, Phil? Are they just another noodley light ski (I already have TM11s and Miras)? Sorry for the thread drift. I've skied them 5 days so far, on shallow powder (good), chunky powder (ok), corn (ok), breakable crust (poor), slush (poor), hardpack (medicore). However, today I found conditions where they really shine. A ski (old white Tua Excalibur with Silvretta 404's)) was buried at the base of one of the rolls at approximately 9200' a few years ago when we encountered a big wet slab break. If anyone, in this record low year, encounters this (and possibly a pair of skins) could they please pm me. I will probably try the trip at least twice before memorial day (not a whole lot else available soon) to see if it gets spit out. Thanks.